SFFS: Another Snippet From "Bait and Switch"
Welcome back, everyone! 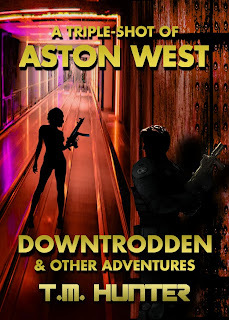 If you haven't already heard, my latest Aston West Triple-Shot is now out and available for purchase (for only 99 cents). Again, you've already seen snippets from "Downtrodden" in the past, so I'll continue on from my previous snippet of "Bait and Switch". And of course, if you like this snippet, head on over to my Collections page to check out this latest Triple-Shot. And be sure to check out all of the wonderful authors on the Science Fiction Fantasy Saturday blogroll. “Audio only,” she alerted me. Aston and those damsels in distress...a wicked combination that doesn't usually end well. So, that's all for this week, and I'll try to bring out the continued installment next week. But why wait, when you can pick upt the entire Triple-Shot #3 (and the other two installments of three stories if you haven't already) over on my Collections page?